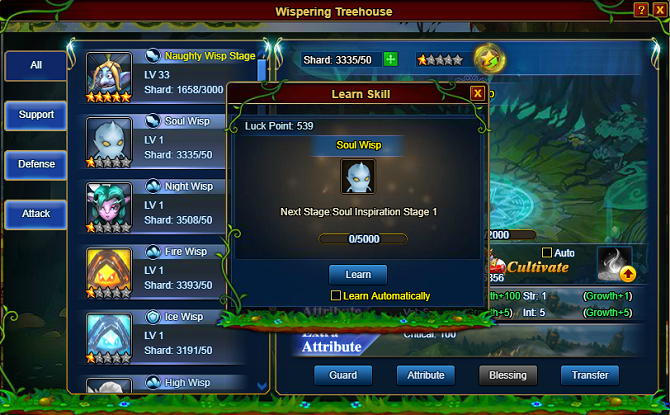 Players can spend Silver or Gold in Wispering Sacred Tree to acquire Wisp. Wisp can guard the main character or buddies, and bring battle skills and status bonus to characters. Press the Play button in the middle of the interface, players can find match with others. 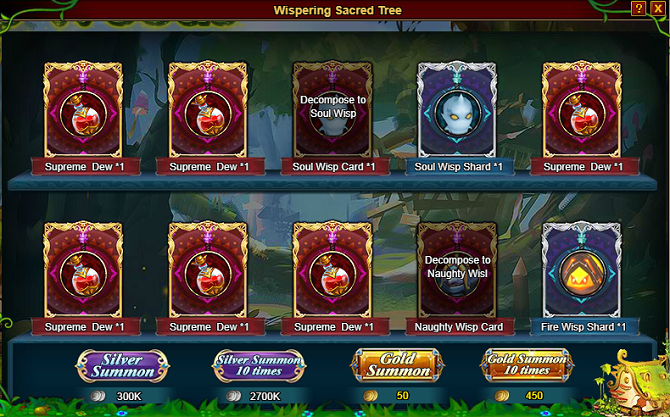 Players can spend Silver or Gold to get Wisp Shard, Wisp Card and Wispering Dew through summoning in Sacred Tree. Wisp Shard: Can be used to increase the star level of corresponding wisp. Higher the star level, better the basic, additional and growing attributes of each level. Wisp Card: Corresponding Wisp can be acquired directly after getting the Wisp Card. If players own the Wisp already, the Wisp Card will decompose into corresponding Wisp Shard*10 automatically. Silver Summon: There will be five free summon chances each day. The free chances can stack and will not be reset. When players use up all the free chances, they can only summon 10 additional times with Silver. 10 Silver Summon: Can be used 20 times at most each day. The chances can’t stack and will be reset next day. 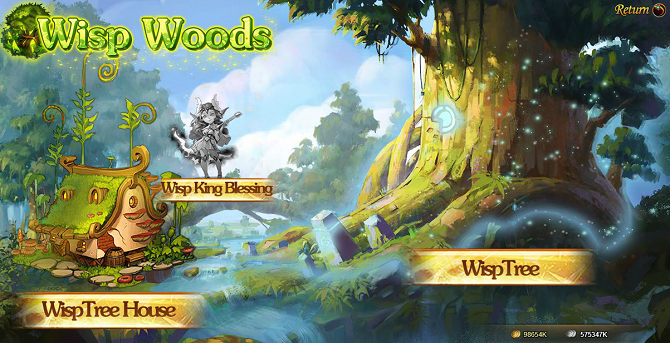 Players can Cultivate and Transfer as well as Guarding Subject in Wispering Tree House. When Wisp Shard reaches 10, Players can click Upgrade button to activate corresponding Wisp. 1. Wisp Star Level: When Wisp shard is enough, the Upgrade button will be highlighted. Click to upgrade the Star Level. 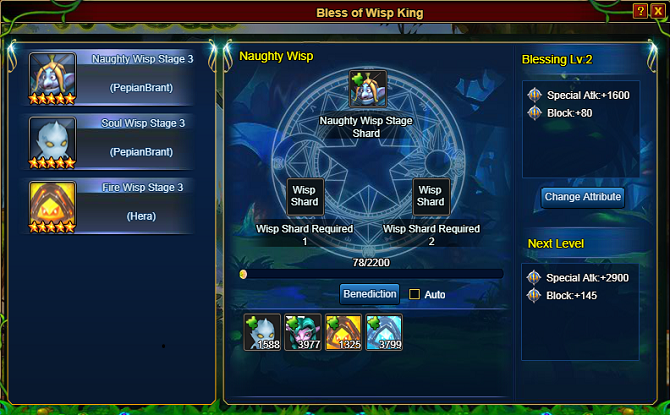 Higher the Wisp Star Level, better the Basic, Additional and Growing Attributes of each level. 2. Wisp Level: Use Wispering Dew to increase Wisp Level. Higher the Wisp Level, better the Basic Attribute. At present, the maximum level of Wisp is 210. However, during the cultivation, the Wisp Level will not surpass the main character level. 3. 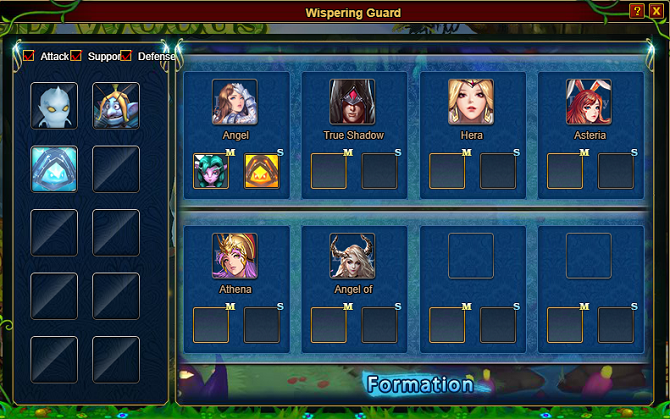 Wisp Skill: Each Wisp has its own skill. Wisp Skill can be learned by consuming Luck Point. When the learning progress is full, Wisp Skill will be unlocked. It will cost Luck Point*100 each time you learn it. Drag the Wisp Icon to Proceed or Cancel Wisp Guard. Each Buddy Can Get Two Guarding Wisp at Most, Which are Main Guarding Wisp and Sub Guarding Wisp. The Skill of Main and Sub Guarding Wisp will come into effect at the Same Time During Battle. Intelligence, Volition, Strength and other additional attributes of the Main Guarding Wisp will be added to the character directly, but Only Intelligence, Volition, Strength bonus of the Sub Guarding Wisp will be added to the character. 5. Wisp Level can be transferred. 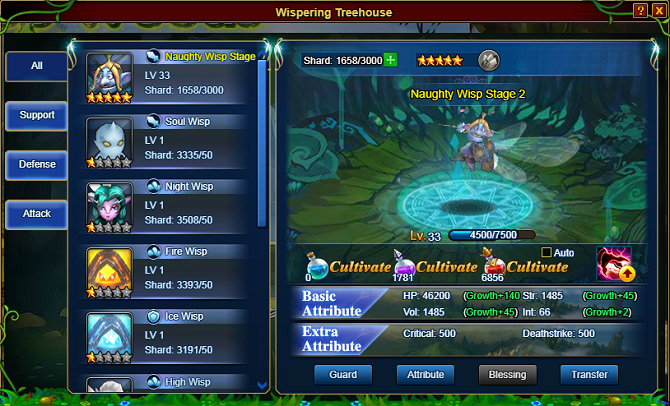 During the Transfer, the original Wisp will be reset to level 1 while the new Wisp will inherit the level proportionally, The level of Gold Transfer is higher than Silver Transfer. Only the Wisp Level will be transferred, the Star Level will stay the same. The corresponding Wisp Shard and Wisp shard of any other two kinds of Wisp are required to increase the Blessing Level. Blessing Level 1, there will be 1 terms of attribute. With the increase of Blessing Level, the amount of attribute terms will also increase. At present the maximum Blessing Level is 15 and three attribute terms at most can be added. If players are not satisfied with the attributes, they can click Change Attribute to change the attribute with Silver.